Hello hello! Aside from out amazing Design team, we welcome many guest designers on the blog this month. The first one up is Franci Vignoli based out of Italy! Let's see what she made for us today! Hello there, it's Franci here with you! Today I'm excited to be a Mama Elephant guest and I'm happy to showcase the new Little Snoman Agenda set with another clean and simple design. I had the best time with this set so far, these cuties are so festive and perfect for so many projects I can't stop creating with them! eheh! So here's my card for today .. I went for a clean and simple look but I stepped it up by creating a long card. I created my card base (that's 6 1/2 by 4 inches) out of white cardstock, then I masked the bottom and sponged some Distress inks on the top half to achieve a nigth sky look. I stamped all the little snowmen and lots of other scene builders from the Me and My Yeti set with a copic friendly ink, I colored them all with copics and die cut them with their coordinated dies. I glued down all the elements with a combo of liquid glue and foam tape and I added some details with a white gel pen ( on to my background too! Just draw little dots here and there to create a snowy sky effect!). Then I stamped my sentiment from the Jingle Greetings set and I added a little heart to finish my card. Hope u like my card and thank you so much for stopping by today! How adorable! Thanks for the inspiration Franci! 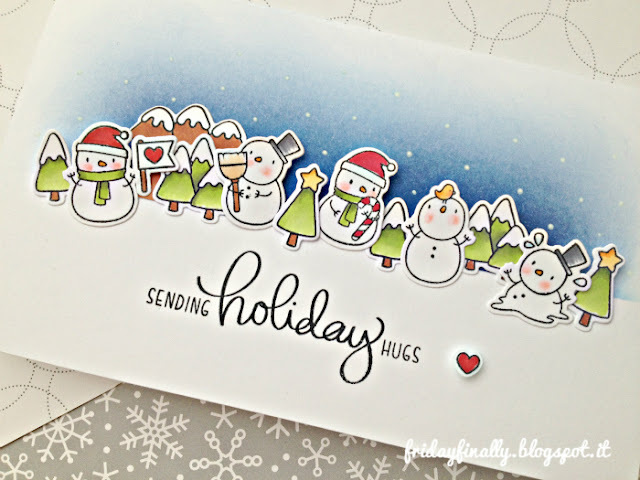 Didn't think I could love the Little Snowman Agenda any more than I already do, but this card is just adorable! Have to get these cute snowmen! super cute, love these snowmen! Such a cute card. My snowmen arrived today. Yay! This is so cute and I love your sky!!! Great job!